Euglena (Euglena gracilis) under a microscope! 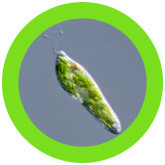 Half-plant, half-animal, Euglena are one of the most studied microscopic creatures. And one of the most fascinating! Learn all about these amazing protists. FACTS: Euglenas are very common aquatic creatures found in fresh water, salt water – and laboratory droplets. They are one of the most studied microscopic organisms! Although Euglenas can squirm and crawl like other microorganisms, their long flagellum twists like a propeller allowing them to pull themselves forward at a much faster speed. And by navigating towards the light, Euglenas can increase their food production. In fact, Euglenas play symbiotic host to green algae and other micro-organisms which produce food for the Euglena while benefiting from its ability to move toward light. Sometimes, they are so successful at eating and multiplying they can turn an entire pond green! Early taxonomists were fascinated by Euglenas because not only can they produce their own nourishment via photosynthesis like plants, but they can also move about and feed like animals by absorbing nutrients from decaying organic matter into their bodies. 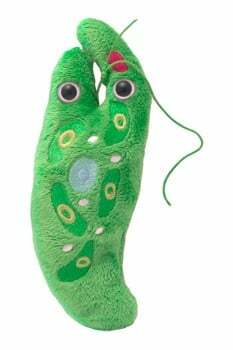 In the end, it was decided that the Euglena was neither a Plant nor an Animal, but a Protist which is, well, neither a Plant nor an Animal – or both. You decide! They’re a natural food source for baby fish, water insects, mussels, and tadpoles. The name originates from the Greek root words “eu” which means well, and “glene” which means eyeball. It describes the characteristic eyespot, or stigma, that reacts to the brightness of light. They’re long, flexible cells that range from 15 to 500 micrometers. Euglena is a group of over 1,000 species of tiny single-celled organisms that live in freshwater ponds and marshes. Euglena was first identified in the 1660’s by Antoni van Leeuwenhoek, a scientist from Austria. They evolved 500 million years ago, making them 7 times older than T-Rex! Euglena exhibit both plant and animal characteristics! They ingest green algae for their chloroplasts and use them to make their own food, but they can also eat and digest external food sources.